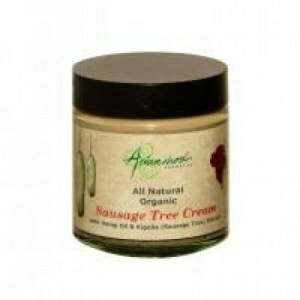 Kigelia Extract in a Soothing Cream. Recommended for Age Spots, Psoriasis, tinea and various other rashes. Ingredients; Aloe Vera, Kigelia Extract, Hemp Seed Oil, Cetearyl Olivate & Sorbitan Olivate, Vitamin E, Colloidal Silver, Cupuaçu Butter, Bergamot citrus bergamia (bergaptene free), Gluconolactone & Sodium Benzoate, Rose Geranium Pelergonium graveolens.